ONE OF THIRTEEN STATIONS on Moscow’s underground. The first section of eight miles was opened in May, 1935. The total length of the system is planned to be about thirty-two miles. On the day of the official opening 372,000 passengers were carried. The gauge of the Metro track is 5 ft, and the capacity of a full-length train of eight cars is 1,500 passengers. MOSCOW, the capital of the Union of Socialist Soviet Republics - usually called Russia by English-speaking people - resembles other European capitals in that it lies on a large river and has grown up round a central core. In this instance the core is the Kremlin, or citadel, which was the ancient residence of the Tsars. The subsoil presented difficulties much greater than those found in the construction of underground railways elsewhere, and because of this the completion of the first section of the system is a great engineering achievement. Until the first section of the Metro, as the underground railway is called, was opened in May, 1935, the chief method of passenger transport was a system of electric tramways. Various circumstances have made the traffic of Moscow different from that of other great capitals. Except for the trams and a few omnibuses there is very little mechanical transport in the streets, as there are practically no privately-owned motor-cars. Even bicycles are rarely seen, and there is comparatively little horse-drawn traffic. The working day has seven hours and every sixth day is a holiday, on which offices, but not factories, close. Factory shifts are arranged so that one-sixth of the workers are off every day. Surface transport is affected by the climatic conditions, especially in winter, when heavy falls of snow of from two to five feet are experienced. 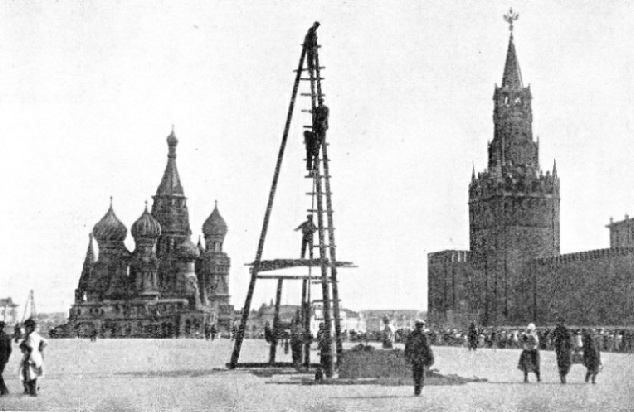 MAKING A TEST BORE in the Red Square, Moscow, before construction. Early borings were made at close intervals and showed that the strata would offer considerable obstacles to the construction of an underground railway, because of the presence of water and running sand. Before the Metro was in operation the trams carried ninety-four per cent of the traffic, and the omnibuses, which were comparatively few, only six per cent. The nine main line railway termini are situated between one and two miles from the city’s centre, so that three-quarters of the passengers require further transport to take them to and from their work. About 150 million suburban passengers used the railway stations in 1931. In the same year the average number of passengers carried every day by the trams was 4,500,000 and by the omnibuses 300,000, and the traffic was increasing by between thirty and forty per cent every year. Just before the Metro was opened it was estimated that the trams carried more passengers than the underground railways and the omnibuses that serve London. In considering this estimate, however, it must be realized that the tramway tickets in Moscow were not interchangeable over more than one route, whereas tickets on the underground railways of London are thus available. So great was the crowd during the rush hours in Moscow that it was often impossible for the conductor of a tram to collect all the fares. Passengers were glad to have handhold and foothold on a vehicle, and they did not care as long as they were being carried along somehow. The best place during the rush hours was on the driver’s platform, and special season tickets for this coveted spot could be bought by individuals whose time was valuable. The rush hours in Moscow are much the same as in London, from between seven and ten in the morning, and between four and seven in the evening. A heavy fall of snow in the night, however, would paralyse the tramways, so that until the track was cleared Moscow’s, work was hampered, walking being the only means of travel. 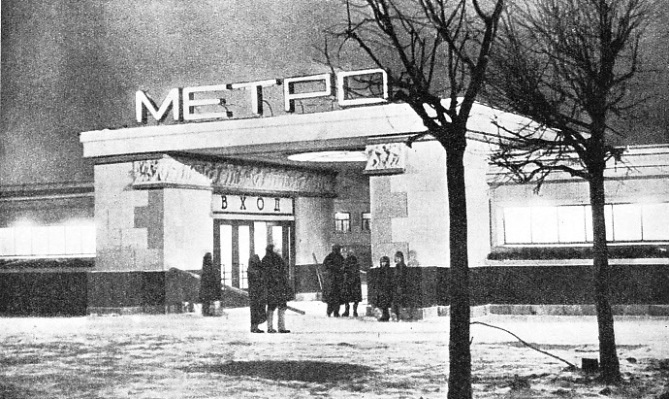 In planning the Metro one of the first considerations of the Soviet Government was to provide a weatherproof system of transport which would enable the workman to reach his place of employment in comfort and in a fit physical condition, without having to undergo an ordeal due to the weather. 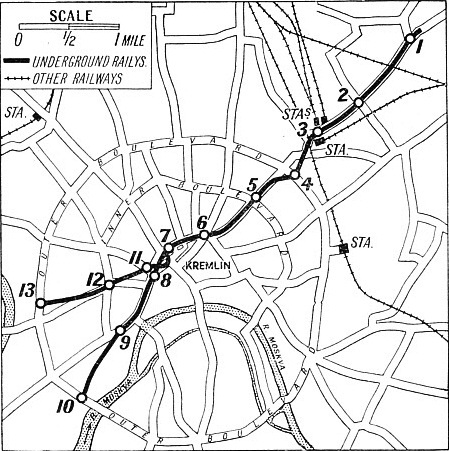 THE FIRST SECTION of Moscow’s underground railway is indicated above. Of the thirteen numbered stations, 1 is Sokolniki, 7 Okhotnie Ryad (the Kremlin Junction station), 10 Krymskaya Square, and 13, the temporary terminus of the branch line, Smolenskaya. The intermediate stations are less important. The Metrostroi, the authority for building the Metro, drew up a scheme for five lines running through the centre of Moscow, thus giving ten radial lines from the centre to the outskirts. This plan has since been altered to provide eight radial lines, totalling about thirty-two miles in length. In May, 1935, the first section of about eight miles was opened. A main line runs from Sokolniki Park in the north-east to the Kremlin and from there to the outer boulevard in the south-west, thus providing two radial lines from the Kremlin; another and shorter line runs from the Kremlin to the west, ending for the time being on the outer boulevard, and forms part of a third radial line. The Kremlin is thus a junction station and the centre of the system. The next section of the Metro, measuring some twelve and a half miles, is now being built and is scheduled for completion by the end of 1938. Trains were in operation on the first section three months before the official opening; guest passengers, numbering nearly a million and including M. Stalin and Mr. Anthony Eden, made journeys on the Moscow railway. As this is the first underground railway in Russia the large number of visitors enabled the staff to gain experience in handling crowds and operating loaded trains. 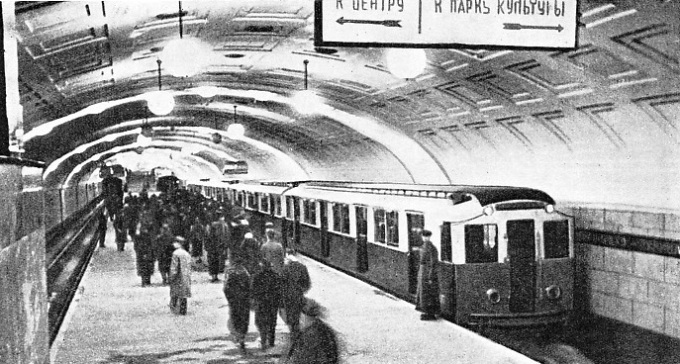 THE FIRST TRAIN to run on the Moscow underground railway. Each car has been designed to seat fifty passengers, and has standing-room for 140 more. At the opening of the line four-car trains were put into operation. 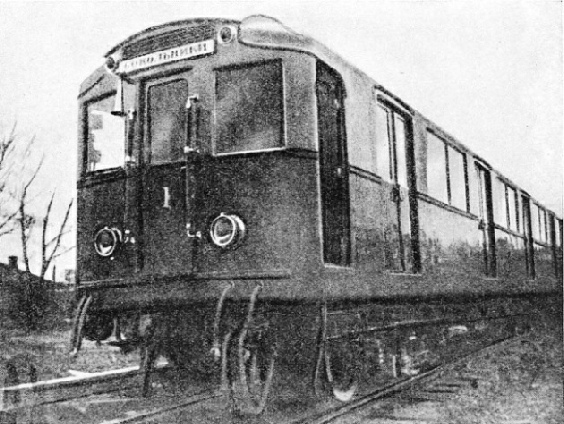 The motor coaches are modelled partly upon those of the District Railway, London, in which the machinery is placed below the floor. As the Metro resembles the District and the Metropolitan Railways of London rather than the tubes, the greater part of it being a subway, the spacious stations give greater scope for decorative schemes. Portraits of prominent men adorn some of the entrances and the interiors of the stations. The pillars supporting the roofs at the stations, which generally have platforms of the island type, are finished in marble. The lighting effects are excellent, no expense having been spared to give light and to avoid glare. On the official opening day 372,000 passengers were carried. The strata upon which Moscow is built proved to be extremely puzzling to the engineers, and provided difficulties not met with in other cities where underground railways are required. Borings were made at close intervals to determine the strata, so that the engineers realized that the problem before them was one of considerable difficulty. There was neither the reliable clay of London nor the hard rock of New York, but a complex formation which handicapped the engineers. 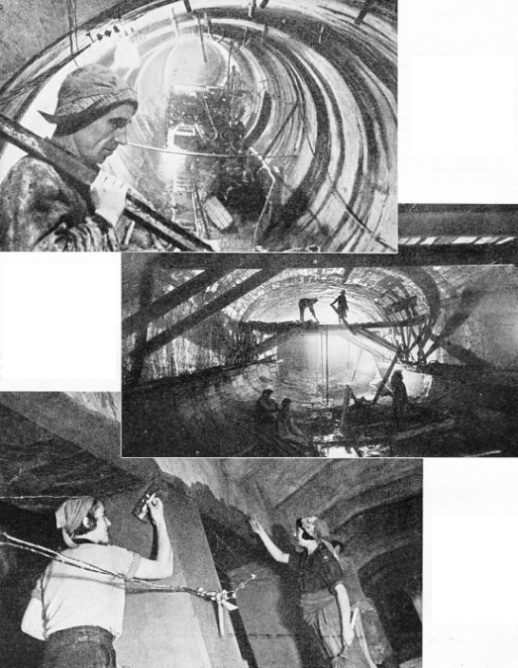 A SECTION of the Moscow underground during the construction. Economic reasons made it necessary for concrete to be used as much as possible, but all the escalators are housed in iron tubes. The diameter of the tunnel is about 15 ft in comparison with the 11 ft 8¼ in of the London tubes. ONE HUNDRED FEET BENEATH THE SURFACE. A striking photograph of a small gang of workers in the Metro. Where the worst ground was encountered tunnelling proceeded under compressed air at 35 lb per square inch. A shield was used in some places to support the face of the tunnel in front of a concreted length. Although many unforeseen difficulties had to be faced, the first section was completed in less than three years. WOMEN AND GIRLS were employed on the construction of the Metro underground railway, and, although most of them were inexperienced, the work proceeded rapidly. This photograph, taken in November, 1934, shows women plastering the walls of a tunnel. What were once the courses of old rivers had become filled with running sand, and the so-called clay was a carboniferous mixture that disintegrated when in contact with water. The running sand was so impregnated with water that it rose in the bore holes when the boring tool was withdrawn. At one place this treacherous mixture extended to a depth of about ninety feet. The existence of this running sand and the absence of a continuous stratum of trustworthy clay was one formidable obstacle. Another was the question of the method of construction, which was affected by economic conditions. In considering the alternative systems of underground railways - subway or deep tube - the question was not only one of engineering, but also one of balancing requirements by supplies. Another point was the fact that shortly before the Metro was planned the city had been almost entirely re-laid with an up-to-date system of sewerage and water mains. On the engineering side a deep tube called for the use of more iron than could be spared. The iron and steel output of Russia is allocated to various industries in the order of need. Since the output is below requirements, the use of iron or steel for the Metro would have entailed an increased deficiency for other vital needs. The authorities therefore decided to use concrete as much as possible, although the escalators had to be housed in iron tubes, as they are in London. The alternative to a deep tube, a subway, could not always avoid the running sand. Furthermore, the levels of the streets in Moscow vary very much more than do those of the streets of London, Paris, or Berlin. As the grading of a railway must of necessity be easier than the grading of a street, it was found impossible to keep at a constant depth below the surface of Moscow. The solution of the problem was to construct as far as possible in “cut and cover” close underneath the streets, but to tunnel under the middle section of the city, which is on high ground. Moreover, the engineers found that under the high section there was better ground at the low level than close to the surface, where practically the whole of it is running sand. In designing the railway the Russian engineers decided that they required the maximum passenger-carrying capacity for their rolling-stock, and they determined to use cars more of the type of those on the District Railway in London than those on the tubes. In the former type practically the whole of the floor area of the trains can be used for the accommodation of passengers, whereas in tube stock, because of the shallow depth from the floor of the car to the rail level (2 ft 2 in), a large part of the motor coach has to be used as a motor room instead of accommodating passengers. In the District stock the electric machinery is housed below the floor. A SIMPLE DESIGN. The entrance to the new underground station in the Sokolniki district of Moscow. Snow has fallen, and it was partly due to the paralysing effect of heavy snowfalls upon street transport that the authorities decided to construct the Metro. The diameter of the tunnel to carry the Russian stock is about 15 ft, instead of the 11 ft 8½-in of the London tubes, although the diameter of the tunnels of the Metro is not uniform throughout. Another difference is that of gauge, that of the Metro being 5 ft, the usual Russian gauge, not the standard gauge of 4 ft 8½ in. The method of making contact between the slipper and the live rail is different from that used in London. In London, contact is made on the top of the conductor rail, but this system is not found practicable in Russia because of the great quantity of snow and ice which forms when electric traction is installed in the open. As it is hoped eventually to extend some or all of the main underground lines into the suburbs on the surface of the ground, a system of what is known as “under contact” had to be employed. The slipper, or shoe, slides on the underside of the conductor rail, which is covered with a continuous hood to shield it from the snow and ice. As the underside of the conductor rail is used for contact, the support of the rail takes the form of a curved arm from the top of the rail, passing outside the rail to its housing in the ground. This system calls for rather more room at rail level than the system of contact employed in London, and is one of the causes of the larger diameter of the running and station tunnels. The length of the station platforms is 150 metres, or 492 ft; this compares with the 350 ft of the platforms on the Central London, Piccadilly, and Morden-Edgware lines, and the 291 ft of the stations on the Bakerloo line. A platform of this length accommodates eight cars. Each car is designed to seat fifty passengers, and has standing room for 140 persons, so that the capacity of a full train is about 1,500 passengers. At first, however, four-car trains were in operation. In the different sections of the railway the construction details vary considerably. Where the railway is close to the surface and construction has been by the “cut and cover” method, the stations, built with island platforms, have columns, either in a single row or more generally in two rows along the platforms, carrying the roof between vertical concrete side walls. In these same "cut and cover" sections the running tracks between the stations are generally constructed between concrete side walls with a substantial invert and with steel and concrete or reinforced concrete roofs, forming a square box section. 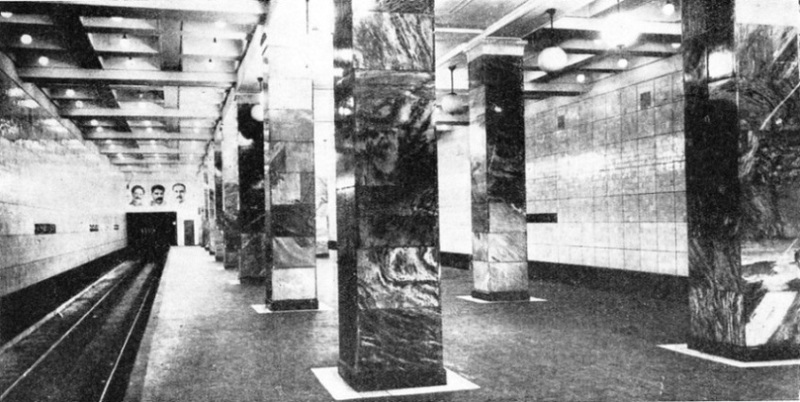 PORTRAITS OF SOVIET LEADERS and fine marble are used to decorate the new stations of the Moscow underground railway. This photograph shows the platform of the Sokolniki Station. The pillars are of grey-blue Ufaleisk marble, and the three large heads at the entrance to the tunnel represent Orjonikidze, Stalin, and Kaganovich. The present lines traverse one of the densest traffic routes of the city. The north-eastern terminus is near the Sokolniki Park, which is about three and a half miles from the heart of the city, and may be regarded as the Hyde Park of Moscow. Proceeding towards the Kremlin is the intermediate Krasnoselskaya Station. The third station is at the Railway Square, where the traffic is the heaviest in the city. Three termini of the nine railways serving the Northern, Leningrad, and Kazan lines face this large square. The Metro proceeds under an important thoroughfare, and the fourth and fifth stations are intermediate ones, serving many Government centres such as the Railway Clearing House. The sixth station is a more important one under a square upon which several streets converge. Here, it is expected, interchange will be made with a projected overhead railway running north and south through Moscow. The seventh station, at the northern apex of the triangle formed by the Kremlin, is the Kremlin junction station. It is near the Red Square, where Lenin’s embalmed body, lying in a glass casket, is visited by thousands of Russians every day. The eighth station, on the west side of the Kremlin Gardens, is close to the Government garage and the Lenin Library. This station is a magnificent piece of concrete construction, the island platform and the two tracks being in one wide, arched structure about 48 ft in width. The ninth station, called the Palace of the Soviets, is in Kropotkin Square, and will serve the new Soviet Parliament House. The tenth station and temporary terminus, at Krymskaya Square, is close to one of the main bridges that cross the Moscow River. The short branch line from the Kremlin junction station has three stations; the nearest to the Kremlin is also close to the Lenin Library as well as giving service to several of the University buildings. The second station is situated on the inner boulevard and the third, another temporary terminus, lies on the outer boulevard. It is close to another bridge over the river leading to one of the most important main line railway termini, Brianski Station. The section from Sokolniki Park to the Kremlin keeps closely to the surface at first. Following the sloping contour of the surface, it has a downward gradient after leaving Sokolniki Station, and it then crosses a fissure in the strata which is filled with running sand. Then it ascends to Krasnoselskaya Station. There is a slight descent to Railway Square Station. From this point the line ceases to follow closely under the surface and descends sharply for a short distance, then easing to enter the fourth station, which is at the deep level. The fifth and sixth stations are at approximately the same level as the fourth. There is a slight switchback to the seventh and junction station at the Kremlin, this station being nearer the surface. A SERVICE SHAFT ON THE METRO. A larger number of shafts than is usual in tunnelling were sunk so that a greater number of workers could be employed simultaneously. The line ascends from the junction and reaches the high level by a slight gradient at the eighth station. The shorter branch from the Kremlin, with its three stations, is a “cut and cover” subway throughout. Before beginning operations the Metrostroi sought the advice of experts in Great Britain, France, and Germany. Lord Ashfield, now Chairman of the London Passenger Transport Board, sent three experts to Moscow in 1932. These three gentlemen were Mr. J. C. Martin, O.B.E., MInstCE, who is now a consulting engineer; Mr. E. T. Brook, Superintendent of Rolling Stock; and Mr. Evan Evans, General Superintendent (Railways) of the Board. They went to Moscow in May and spent a fortnight in consultation with the Russian engineers, gathering information about the scheme for the purpose of reporting to Mr. Frank Pick, the Vice-Chairman of the Board. The framing of the report and the recommendations of the trio took some six weeks to formulate. After endorsement by Lord Ashfield and Mr. Pick, Mr. Martin, in company with Mr. David Anderson of the firm of Mott, Hay and Anderson, consulting engineers to the Board, went to Moscow with the report which had been amplified by Mr. Pick and Mr. Anderson. They presented the report to M. Rotert, the Chief Engineer of the Metrostroi. A few days before the official opening of the Metro, the Russian ambassador in London invited Lord Ashfield, Mr. Pick, Mr. A. R. Cooper, Chief Engineer of the Board, and the four other gentlemen to attend the opening. Messrs. Cooper, Anderson, Brook, and Evans visited Moscow, and all the seven were awarded the degree of honour of the Moscow Soviet in recognition of the services they had rendered. 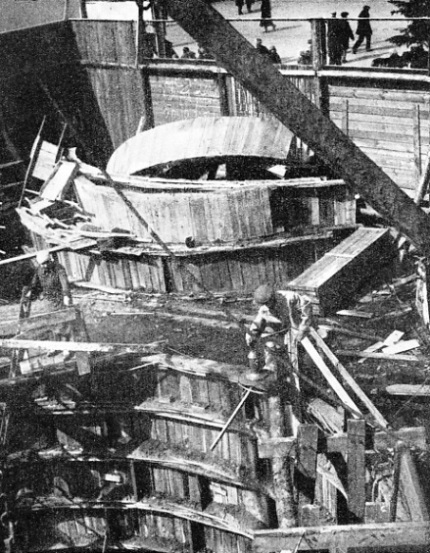 All sections of the construction work of the tunnels, as seen by the London experts who were present at the opening ceremony in Moscow, were found to be dry. This speaks highly for the work executed by the Russian engineers. You can read more on “Russia and Siberia”, “Russian Steam Locomotives” and “Underground and Overhead Lines” on this website.